Get to grilling & chilling with these easy-to-craft permanent, portable or solar outdoor kitchen setups. The author grills dinner on the cinderblock grill that she and her husband built. They wanted it to be waist high so they wouldn’t need to stoop over when using it. To keep the heat in the firepit from cracking the concrete, the Norris’ cut an opening a few inches larger than the funnel. 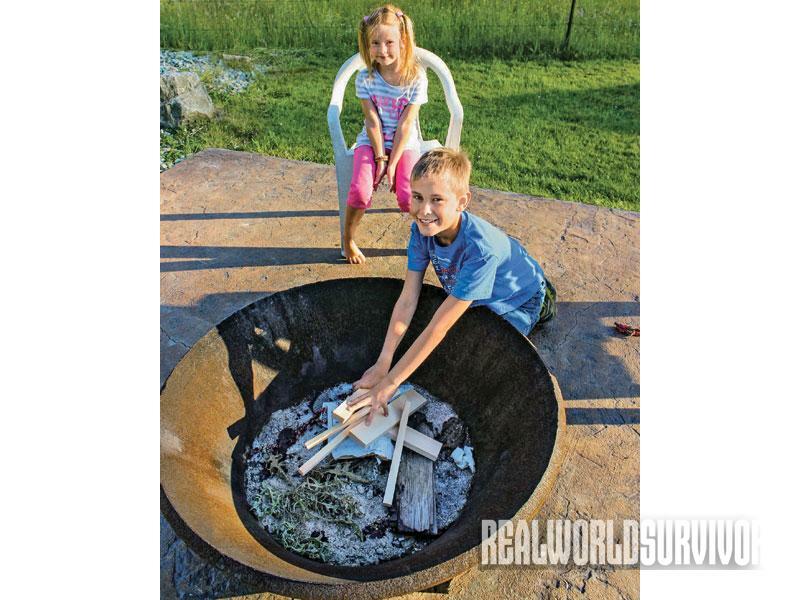 The Norris children build a fire in the fire pit, built with an old funnel from a rock quarry. 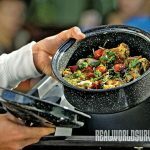 Melissa Norris can cook complete meals in her outdoor kitchen, everything from roasts on a spit to chili and vegetable casseroles, like the one shown here. 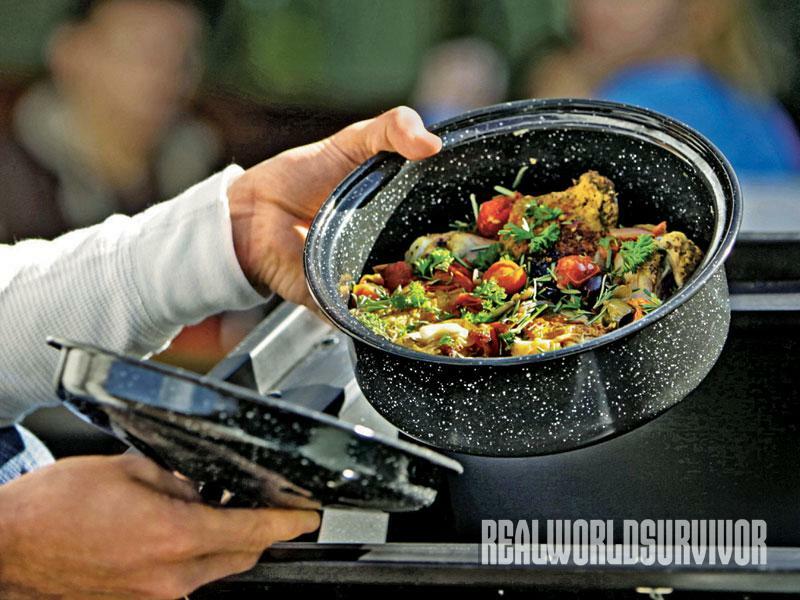 The above dish was prepared in a Solavore Sport solar oven. 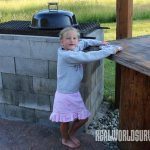 As we began embracing more old-fashioned skills on our homestead, our yard evolved into not only a place for relaxation, but also a functional area that makes us more self-sufficient. Since creating our outdoor cooking space, we’ve come to appreciate it for many different reasons, such as during power outages or when the hot summer months make cooking in the kitchen unbearable. 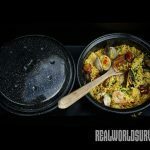 I’ve been in the middle of cooking supper when we lost power and been able to build a fire in our fire pit or light charcoal, then transfer my cast-iron skillet full of food to our raised grill without worrying about how to finish cooking. 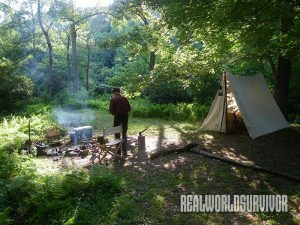 We have two different areas set up for outdoor cooking. 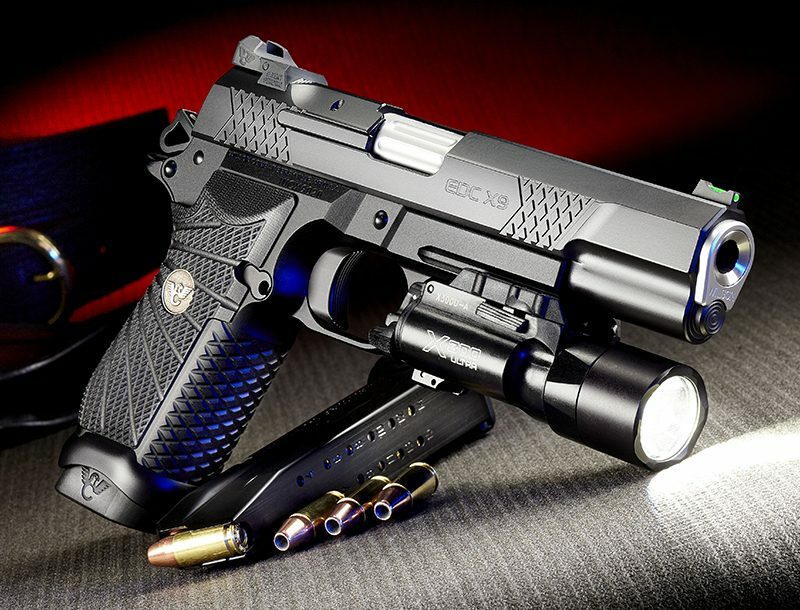 One is designated for roasting and larger fires. 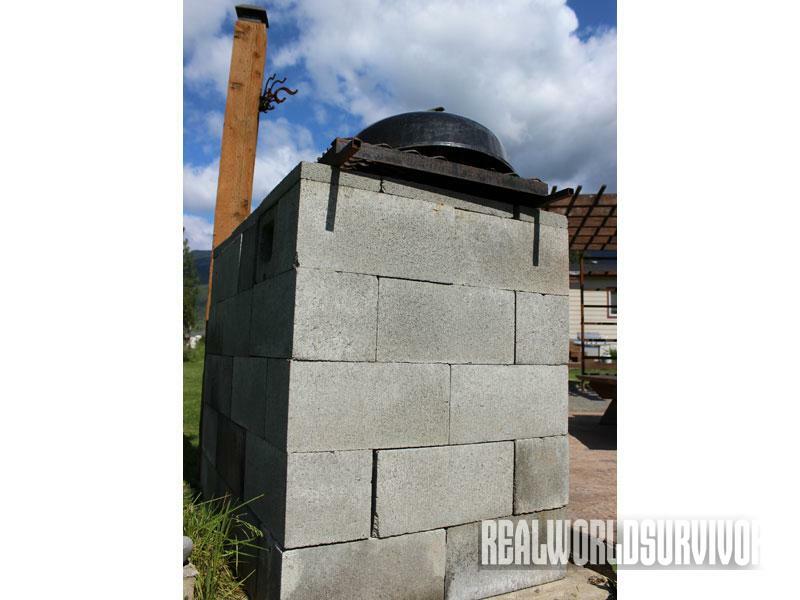 It’s used for Dutch oven cooking, roasting over an open flame, and it’s where we heat up our scalding tub during butchering time for our pigs. 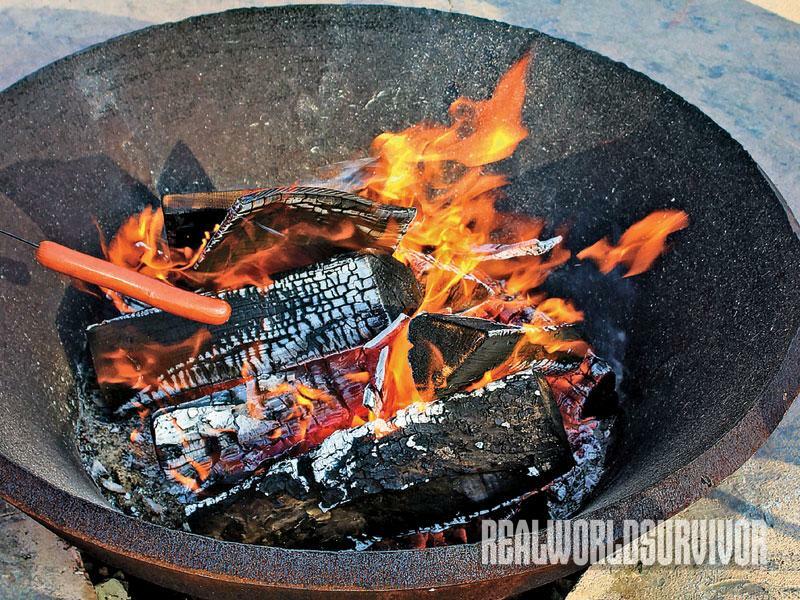 Having a fire pit works well for Dutch oven cooking for two reasons. It provides a windbreak so the wind does not blow ash around and make it harder to maintain an even temperature. Second, it provides a barrier for children and small animals. Once heated, the cast iron is quite hot, and the fire pit keeps my kids from accidentally brushing up against the Dutch oven and burning themselves. When selecting an area for outdoor cooking, make sure it’s not too far from your house so you won’t have to travel a long way with ingredients and supplies to prepare a meal. Make sure you don’t choose a spot near trees or bushes that could easily catch fire. We put ours in an open spot away from our evergreens and forested land. We wanted a permanent area without having to weed or do much maintenance. Clean gravel is an option, but we wanted a concrete patio. We poured and finished both pads for the outdoor cooking area the same day, since most concrete companies require that you buy a minimum number of yards per delivery. However, you can also use well-packed dirt, although this makes things more difficult during rainy weather like we get here in the Pacific Northwest. Our first fire pit was made from an old rim from a log truck tire. It created a perfect circle for a pit. However, we poured our concrete right up to the edge of the ring, not expecting our fires to be hot enough to cause a problem. We learned from our mistake. We were having a large barbeque when I heard a bang. Two cracks the length of our concrete pad marred our lovely finish. Heat from the fire made the metal ring expand and the pressure cracked the concrete. My husband cut out the tire rim and we were able to get an old funnel from a rock plant to use as our pit. We made sure to cut back the concrete by a few inches from the funnel to avoid any more cracks. We also set up our smoker in the pit when it comes time for smoking meat or cheese. 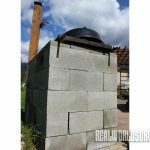 The second area is a permanent raised grill. It stands waist high so we don’t have to stoop over while cooking. My husband took a metal grate and added handles so we could slide it off while building a fire or adding wood, and then slide it back over the flames. With a metal grate, we can cook directly over the fire when grilling meat or corn on the cob that’s still in the husk. I can set my cast-iron skillet over it and cook just like I would on a regular cook stove. We’re in the process of designing a hinged lid that will also turn this into a smoker. 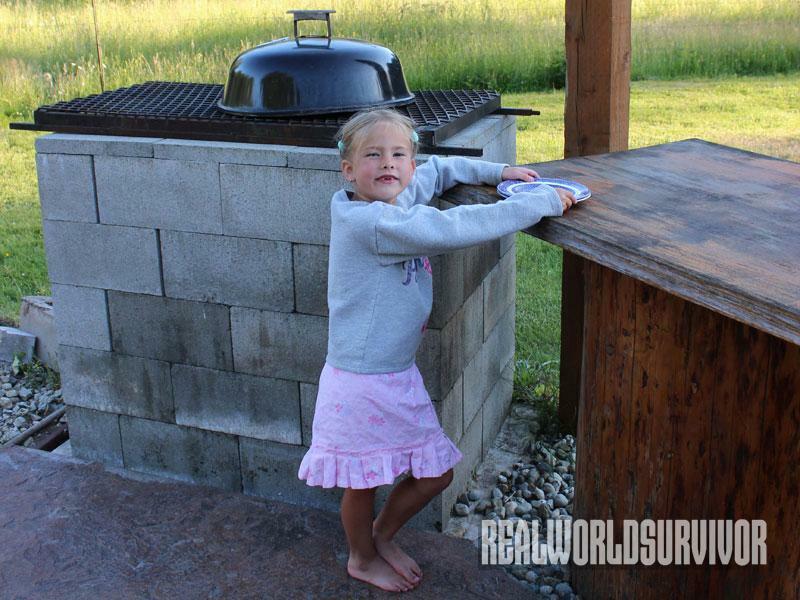 The most important thing when building a fire pit or raised grill is to make sure the ground is level. We then poured a small concrete pad. You can use dirt, but it will settle and buckle over time, especially in climates where it freezes and thaws. After we had our level surface and pad, we laid the bottom row of 8- by-16-inch cinderblocks to form a rectangle approximately 48-inches long, 32-inches wide. We stacked the blocks four rows high, then filled in the center with large boulders and rocks, and back-filled with sand until it was flush with the top of the fourth row. Then we placed a layer of cement firebricks over the sand. We build our fire on top of them. Next, we added the last (fifth) row of cinder blocks, placing one on its side so oxygen can feed the cooking fire. 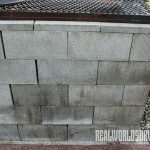 We used a layer of solid cap concrete blocks on top of the cinderblocks to hide all the holes and give a finished look. We did not mortar in the blocks since we wanted to be sure this was the final design. After five years we have no plans to change it, but we’ve not mortared them in yet. After a year, we added a permanent worktable next to the raised grill area. We used two large logs for the legs. My husband is a sawyer and we had access to wood. We dug out a level area and then placed a cement paver beneath each log. After applying a layer of log end seal (to help prevent rot), we placed washers on the pavers for breathing and placed the logs on top. We back-filled with a layer of pebbles and rock for drainage. The tabletop is two thick slabs of wood glued together. When serving a meal or cooking, having a work surface right next to your cooking area is indispensable. We also placed a post near the cooking area with hooks to hang utensils and lanterns for light. Having a sitting area also makes the time spent in an outdoor cooking area more enjoyable. We have a grape arbor at the end of our patio and enjoy the fruit at summer’s end. 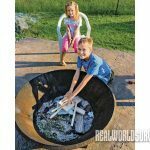 When using wood heat for cooking outdoors, you’ll want to make sure you have a good supply of dry wood. Green or wet wood not only smokes and creates creosote, but it won’t produce much heat. Keep a wheelbarrow full or a stack of wood nearby, but not close enough so a spark could set it on fire. Having a supply of dry kindling and tinder will also make starting a fire much easier, especially if you’re in a hurry to get food cooking. 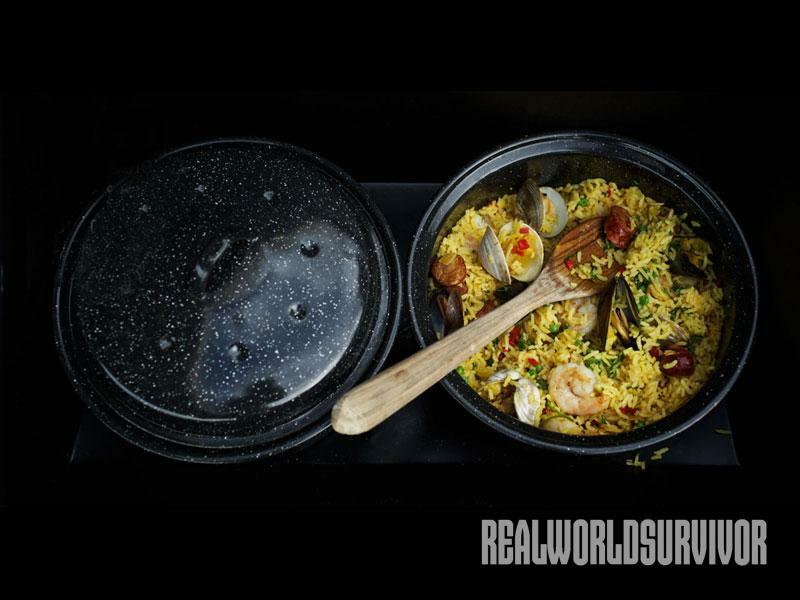 Cooking over wood requires more attention than does a gas or electric stove. It’s easier to add more wood to increase the heat than it is to take away or try to cool down the fire. 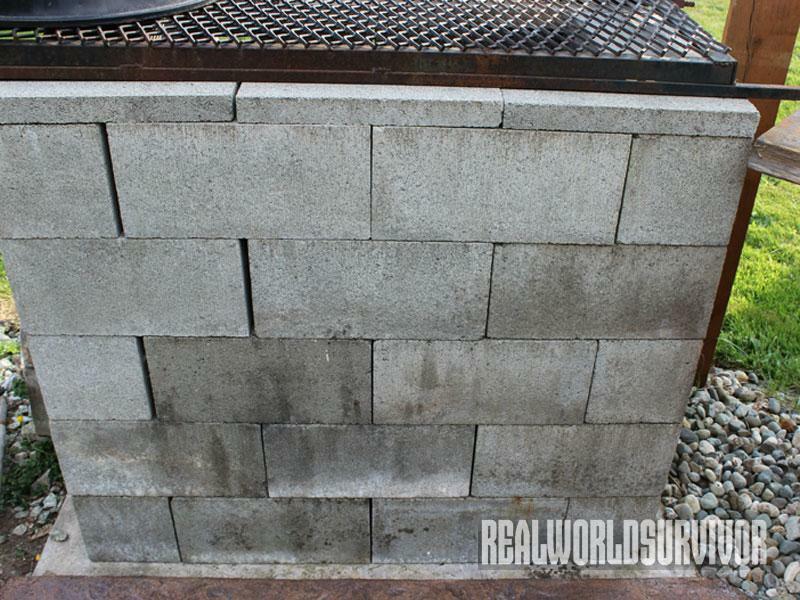 Build your fire to one side or in the middle of the grill so you have a cooler area where you can move dishes. Start the fire on the small side and add more wood as you need more heat or add more dishes. It takes some practice to learn how much wood you’ll need for your cooking time, but after a few dishes you’ll begin to learn. It can also depend on the kind of wood, since some kinds burn hotter than others. Generally speaking, hardwoods will burn hotter than soft and are a better choice. Maple is an all-around good choice. Build your fire about 10 minutes before you want to begin cooking. It’s the coals that produce the heat, not the flames. 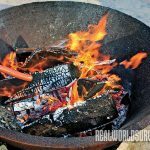 If you’re almost done cooking a dish and need just a bit more heat, use a long stick to spread out the coals and, as oxygen hits them, they’ll produce a short burst of extra heat. Check with your local fire department about the specifications for fire pits and grills during burn bans and fire season. For more outdoor cooking tips and tools, visit http://www.melissaknorris.com/outdoorcooking.